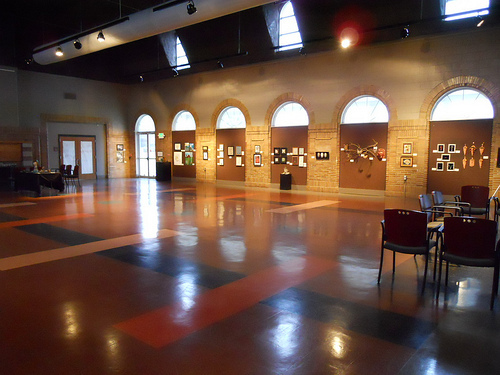 The Garfield Park Arts Center (GPAC) seeks exhibit proposals for its 2013-2014 exhibit season. Individual artists, art groups and other organizations interested in submitting exhibit proposals for consideration for the 2013-2014 exhibit schedule should familiarize themselves with the EXHIBIT OVERVIEW, PROPOSAL GUIDELINES and STANDARDS FOR EXHIBIT below. For specific questions, please contact Lesley Meier, Garfield Park Arts Center Manager at lesley.meier@indy.gov or 327-7091. Proposals can be submitted at the Garfield Park Arts Center, 2432 Conservatory Drive, Indianapolis, IN 46203. To create fun, safe, engaging and sustainable parks that enhance the quality of life for individuals, neighborhoods and communities. The Main Gallery is equipped with a professional, museum quality hanging system. The room offers a combination of wall surfaces including brick, mortar and fabric. Walls are neutrally painted and or covered. There are many beautiful architectural elements including two large fireplaces which need to be considered when installing the exhibit. NO holes may be drilled or otherwise created in any brick/masonry walls for any reason. Adhesives for hanging identification tags are limited to sticky tack and/or beeswax. Changeable gallery lighting is available- six 22 foot tracks each with four 500 watt fixtures. Some lights do need to be reserved for general lighting but that is generally not a conflict with the wall lighting. Sunday & Monday: By appointment. Use of the building’s hanging system – an equipment check out sheet will be used to keep track of hardware inventory- Exhibitor will be responsible for the cost of replacement for any hardware that is lost or damaged during the exhibit installation or removal. Repositioning of lights (once, after installation). Access to the space for installation at mutually agreeable times. Tags created to GPAC minimum standards. (2×3 business card size, listing title, media, artist and price if applicable). Inclusion on the GPAC Facebook page, blog, and Twitter and other social media as available. Inclusion in the GPAC event E-Blasts. Regular viewing hours for the public (including weekends and evenings) and general staffing of the building (we do not directly monitor exhibit spaces at all times). Submission of exhibit information to the Arts Council and ten or more online community calendars. Inclusion in an Indy Parks press release when all deadlines are met and if applicable. Exhibit listing in the Indy Parks Program Guide when all deadlines are met. Additional building hours to support an opening reception if desired by both the Exhibitor and GPAC Management. Price list and/or programs (design and printing). Please note that all additional marketing must include the Indy Parks logo, GPAC branding image and be approved by Indy Parks before printing or distribution. Completed loan agreement (provided by the GPAC) prior to exhibit installation. Completed hanging system hardware check out sheet (provided by the GPAC) prior to exhibit installation. Titles, sizes, prices and media of all works and artist contact information for inclusion in a price list and/or programs. All labor for installation of the exhibit. Images suitable for press release, postcards and programs. 20% commission from the sale of any works. Artist presence at opening reception (if applicable). Food and beverage for the opening reception (if applicable). Live music for the opening reception (if applicable). If you are unclear on any of the guidelines or standards, a GPAC staff member will be happy to work with you. While the GPAC would prefer to receive submissions on CD, all complete entries will be considered. A proposed layout including descriptions of any non-traditional use of the space (use of ANY non-wall space). Exhibitors may be invited to show their work in alternative gallery spaces at other Indy Parks facilities. ALL WORKS MUST BE THE ORIGINAL WORK OF THE ARTIST. No reproductions or copies will be accepted without special permission of the GPAC management. The GPAC management will confirm the receipt of all complete proposals. Applicants may call or email to confirm receipt. Jury Process: All applications will be juried by staff from the GPAC and Indy Parks Senior Management. Exhibitors are chosen based upon the quality and originality of their work, as well as the suitability for a family audience.